Washington Speakers Bureau, using directory technology from eSpeakers, operates WSBDirectConnect. WSBDirectConnect is a self-service website where event organizers can find world-class speakers at a range of price points below $10,000. The WSBDirectConnect site includes a a hand-curated list of speakers who have an eSpeakers profile and meet WSB’s selection criteria. 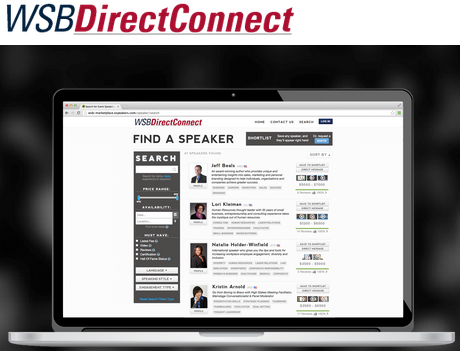 WSB’s agents and marketing material send customers to the DirectConnect site to find and hire speakers.